I was surprised to see All Good Organics Fair Trade Bananas right at the entrance of one of my grocery suppliers recently. I thought the move may have resulted from the stoush between the owners of the Fair Trade bananas – New Zealand’s All Good Bananas, and Dole’s Ethical Choice brand. However Chris, the fresh produce manager at the supermarket, said the move was because of a special they were running. 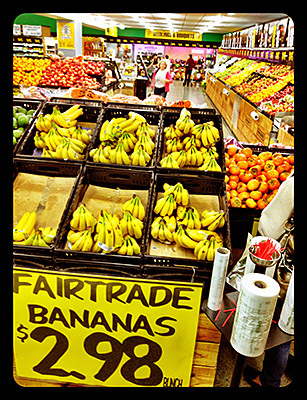 Either way it was good to see they sold a lot more Fair Trade bananas from the new location.